Thank you to Precious Moments for sending product for review in exchange for my honest opinion. My daughter is a “girly girl”. She’s three years-old and loving everything pink and frilly! It’s funny because I was never what you would call a “girly girl”. I was an only child and my parents had a deal – mom could dress me up in pink and dresses until I was three – then I was dad’s. Dad had me doing all kinds of ‘boy’ things like hunting, fishing, and playing every sport with me that I showed interest in (and more). I was never really into clothing or makeup, refused to wear pink (and dresses for the most part) and carried a billfold until I was in college. After I found out I was having a little girl of my own I really started to come around to the idea of pink. I couldn’t wait to dress her up, the girlier the better! When she was a baby she always had a headband or bow of some kind on. Now, she loves to play dress up and use her imagination. Currently she has an infatuation with unicorns and even had a ” real unicorn” on her Christmas list this year for a little while. Although she quickly chose some other gifts to ask Santa for that were a little more manageable, I was excited to see the new Precious Moments Young Girls Collection featuring some perfect gift ideas for little girls. 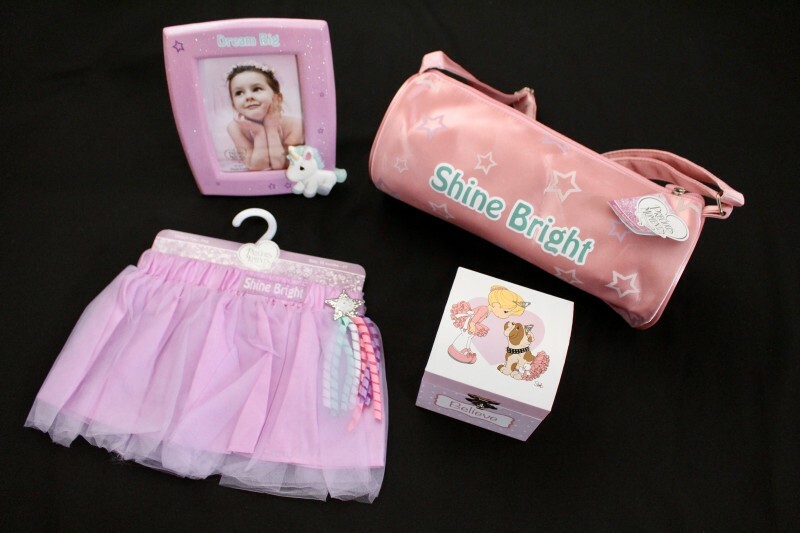 We received the Believe Balerina Musical Jewelry Box, Shine Bright Tutu, Shine Bright Duffel Bag and Dream Big Unicorn Photo Frame for review from the Precious Moments Young Girls Collection. As you would expect with Precious Moments items, they are all beautiful and well crafted. 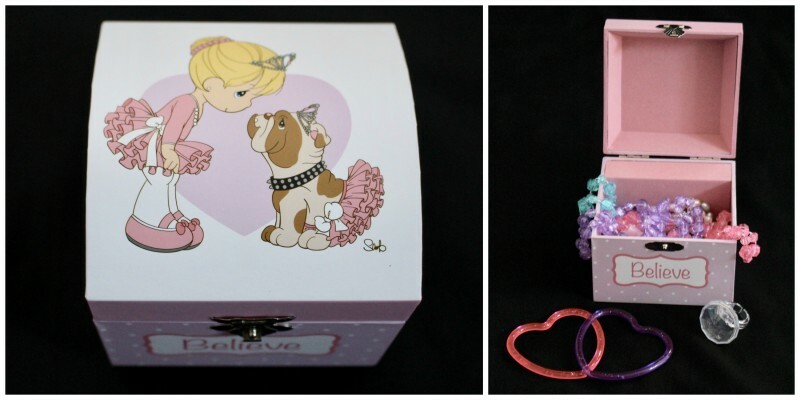 The Believe Ballerina Musical Jewelry Box is perfect for a little girl’s first jewelry box. I’m pleased with the box as is, but it really would be neat to have a mini Precious Moments Ballerina pop up and twirl as the music plays when you open the box. Maybe an idea for a future version Precious Moments? 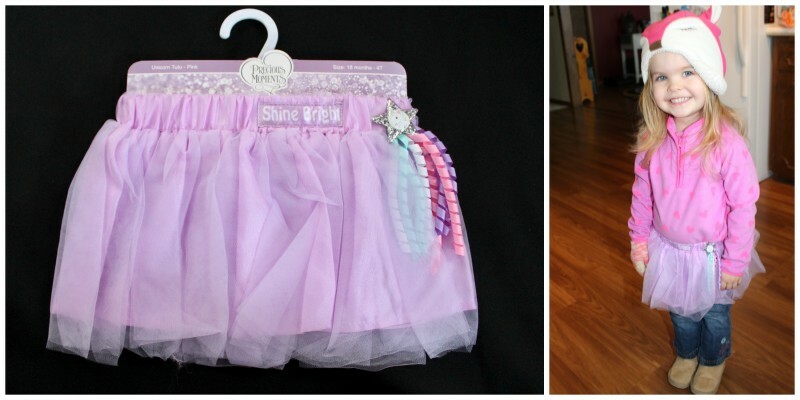 The Shine Bright Tutu skirt fits size 18 months-4T with its stretchy waistband. My daughter wears size 3t clothing and it fit her well. She loves the sparkly unicorn adornment and those pretty curly ribbons! Note in the picture above, she chose her outfit that day, complete with one mitten and winter hat even though we weren’t heading outside! The Shine Bright Duffle Bag is a perfect first duffle bag for little girls. It would be perfect to fit a water bottle and pair of dance shoes in when going to practice. It also nicely holds little stuffed animals or other play necessities that she wants to tote around. 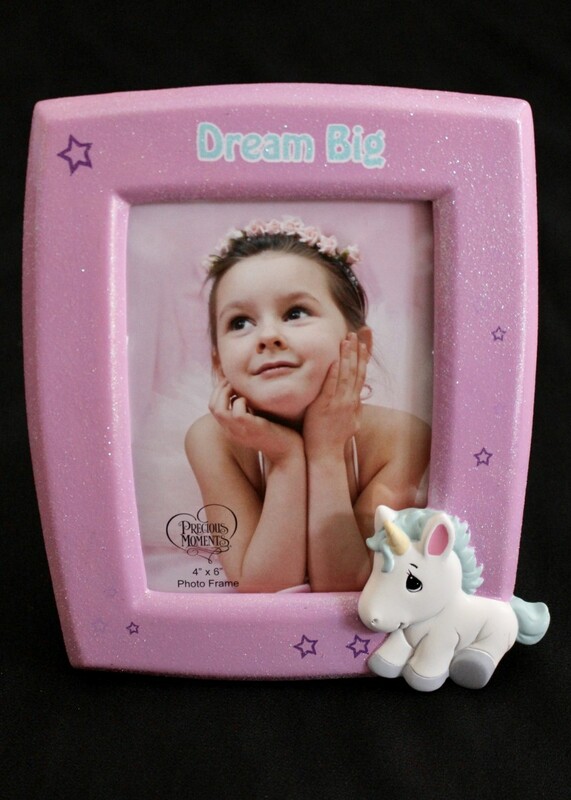 The Dream Big photo frame would be an adorable accent to any little girl’s space. It is pink and sparkly with the sweetest Precious Moments Unicorn adornment. Perfect for a 4×6 picture of your little one all dressed up. So, if you are in the market for some super cute gift ideas for a little girl in your life, check out the offerings from Precious Moments! There are a few other fun items in the Young Girls collection that are not included in this review. Check out the whole collection by clicking the link below. Buy It: Head over to Amazon to see for yourself the great selection of products in the Precious Moments Young Girls Collection. Connect: Don’t forget to like them on Facebook and follow them Instagram for all the latest news and promotions. The little box would be great for keepsakes! Your daughter is adorable. OK, if she wants pink she should have it. I just wish there were more colors to choose from. Oh my gosh, this is so precious (pardon the pun)! My niece would have loved this when she was younger! These are so adorable! What a great gift for a little girl under the Christmas tree. I love Precious Moments. My Mom had a collection that always made me smile. I gave my granddaughter a ballerina on her first dance recital. She smiled too! That is such a cute gift idea for a little girl–I particularly love the box! Your daughter, by the way, is absolutely adorable!